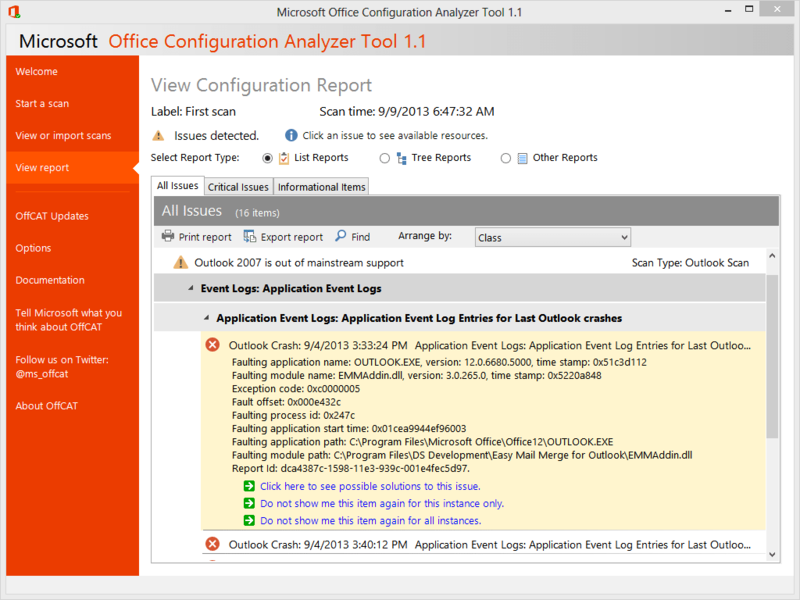 Outlook Add-ins - Email Productivity Tools > Outlook Tips & Tricks > Outlook 2013 Keeps Crashing? Here Is How To Fix It! – a conflict between 3rd party add-ins or between Outlook and a 3rd party Outlook add-in. 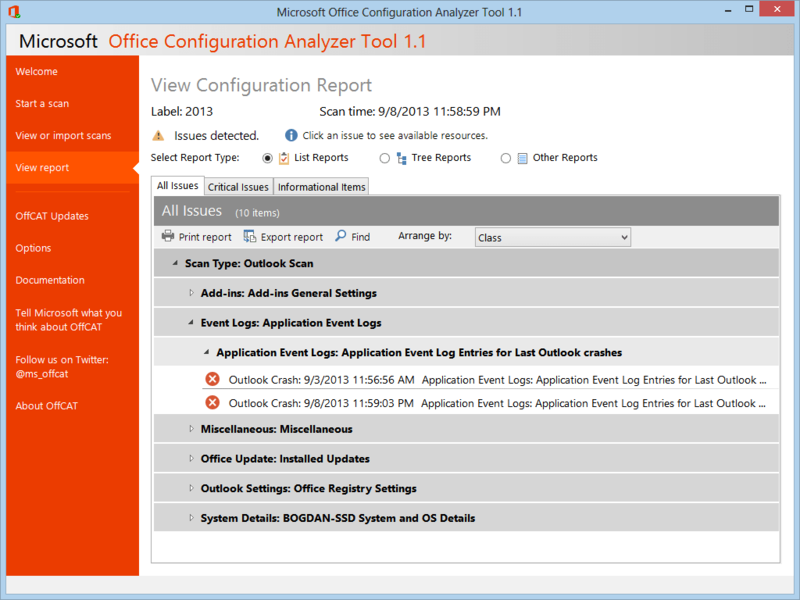 Once you’ve installed the Office Configuration Analyzer Tool (OffCAT), run it and choose to generate an Outlook report by clicking on “Start a scan” -> select Outlook -> type any name you want in the label section and click on “Start scanning”. The main advantage of this Outlook diagnostics method is that it reports not just information about your Outlook 2013 crashes, but it also scans Outlook for invalid registry entries, performance issues, outdated add-ins, available Outlook updates and other known issues. Do not ignore the suggestions prompted by OffCAT, otherwise these issues are likely to cause Outlook problems. Notice the red icons in the above screenshot: they indicate Outlook crashes. If your Outlook 2013 crashed recently, OffCAT should report these crashes: click on one of them to open the actual crash event report. These solutions should also apply to previous Outlook versions, too. – if Outlook is also running slow, use Weight Diet for Outlook to clean up Outlook of obsolete items and optimize your data files. – uninstall the faulty add-in (here is a tutorial about how to properly remove Outlook add-ins). However… based on our experience of over 10 years of Outlook related support, we can safely say that most Outlook crashes are actually caused by different reasons: a faulty Windows system (infected by a virus or badly configured) or hardware issues that trigger system-wide errors, including Outlook crashes. 2 Responses to Outlook 2013 Keeps Crashing? Here Is How To Fix It! I had the same problem, but it was my fault. I use many rules to shift emails to different folders. Some folders were no longer of any use. I deleted the folders and moved some of them but forgot the rules. Shut down, restart… shut down, restart… shut down, restart… etc., etc., etc. I deleted the rules or redirected the output. Shut downs stopped. The rules rule!